I have taught Griffin (9 years old) the Fundamental Theorem of Calculus. Details and discussion coming soon. In the meantime, see Kristin’s related post. Full disclosure. Griffin was paid a sum of $0.25 for his performance. Last summer, the super-smart, super-creative team at Desmos (in partnership with Dan Meyer, who may or may not be one of the Desmos elves) released a lovely lesson titled “Penny Circle“. It’s great stuff and you should play around with it if you haven’t already. The structure of that activity, the graphic design, the idea that a teacher dashboard can give rich and interesting information about student thinking (not just red/yellow/green based on answers to multiple choice questions)—all of it lovely. And—in my usual style—I had a few smaller critiques. What sometimes happens when smart, creative people hear constructive critiques is they invite the authors of the critique to contribute. Sometimes this is referred to as Put your money where your mouth is. So late last fall, I was invited to do this very thing. 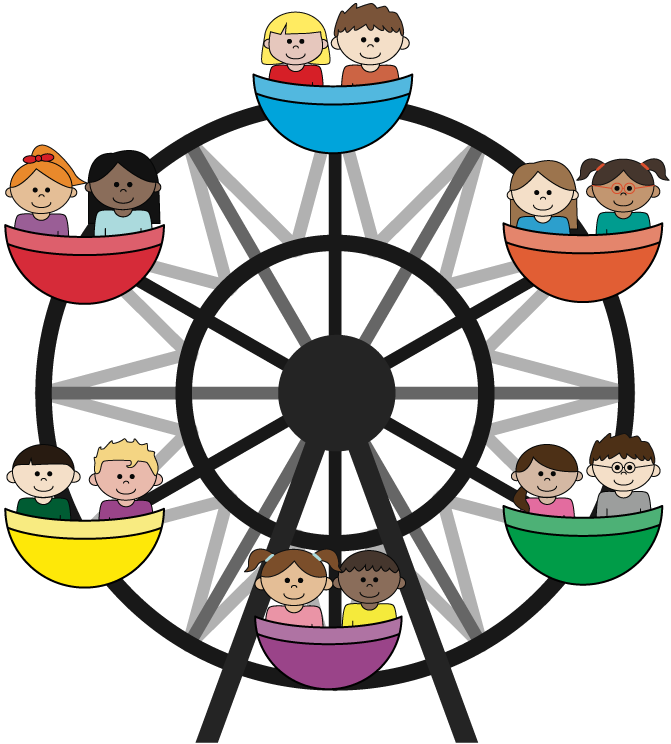 I have been working with Team Desmos and Dan Meyer on Function Carnival. Today we release it to the world. Click through for some awesome graphing fun! It was a ton of fun to make. I was delighted to have the opportunity to offer my sharp eye for pedagogy and task design, and to argue over the finer details of these with creative and talented folks. Then let us know what we got right and what we got wrong (comments, twitter, About/Contact page). Because I just might get the chance to work on the next cool thing they’re gonna build. More lazy email(ish) excerpts. 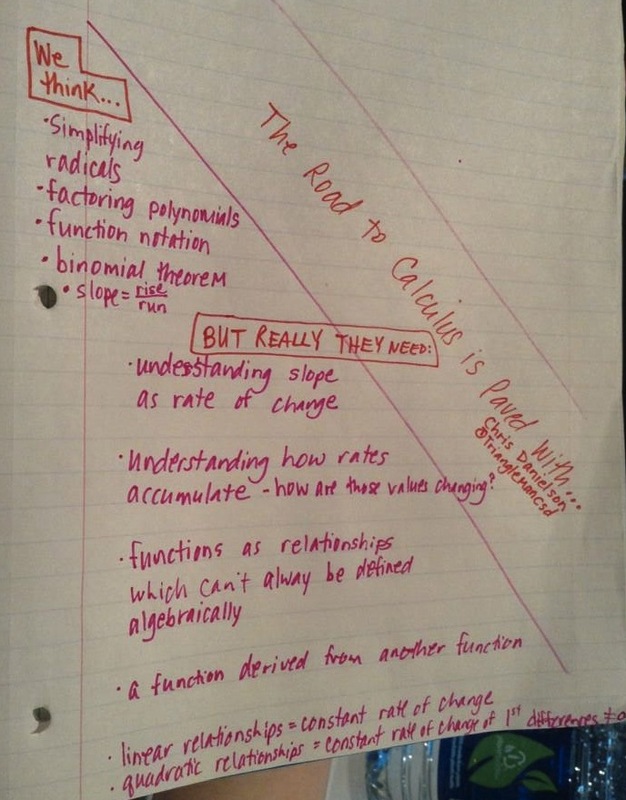 This one from a conversation about polar coordinates, and my Calculus II students’ struggles with them last semester. I don’t fully understand the usefulness of polar coordinates as traditionally presented. I feel like a great deal of the focus is on the pretty pictures we get when trig functions interact with polar coordinates. Cardioids and all that. What do we gain from graphing this in PreCalc? When I taught Calculus 2 this past semester, it was clear that my students were struggling to sort out differences between cartesian coordinates and polar coordinates. They knew how to convert between polar and cartesian coordinates, but they didn’t seem to know why one would do that, nor did they seem to see polar coordinates as a self-contained system. Polar coordinates were always (in their minds) in relation to cartesian coordinates. My students struggled to think about an angle as an independent variable that could change (and correspondingly a radius as a dependent variable that could change). They couldn’t view a function defined in polar coordinates as a dynamic relationship. They could identify points one at a time. They could make their graphing calculators display polar graphs. But they couldn’t think about the process of tracing out a polar graph. This seemed to be true even for students who could talk dynamically about cartesian graphs (increasing, decreasing, approaching an asymptote-this was terminology my students could apply to cartesian graphs, but not to polar ones). The precise conceptual nature of the relationship between polar coordinates and cartesian parametric equations is unclear to me. My students saw some relationships that they couldn’t quite articulate. I’m interested in exploring this territory a bit. For the record, I was flying blind through this material last semester. It was the first time I had taught polar coordinates in any serious way. 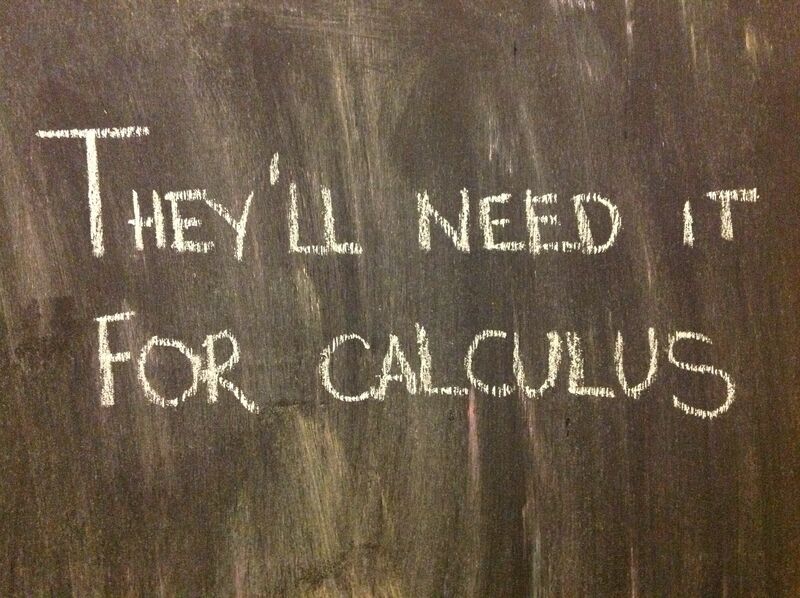 I have never taught precalculus. I had never taught Calculus 2 before. So I kept bumping into obstacles that I hadn’t imagined would be there.